a man cooking is actually a man deciding to renovate his house, decorating the backstage silently, painting the green room afresh, scratching the soiled back of his ancestors, getting into the shoes of his womenfolk, resetting a straw or two of his nest. PUBLISHED IN THE PRESTIGIOUS JOURNAL ‘INDIAN LITERATURE’ (Volume 248, November/December 2008, Guest Edited by Prof. K Satchidanandan)) BROUGHT OUT BY SAHITYA AKADEMI, (THE INDIAN NATIONAL ACADEMY OF LETTERS) NEW DELHI. ITS HINDI VERSION, TRANSLATED BY THE EMINENT HINDI POET MANGALESH DABRAL, WAS PUBLISHED IN THE PRESTIGIOUS HINDI JOURNAL 'PAHAL', No. 85, February 2007. Asian ivory Okimono, finely carved figure of a man sitting and preparing food with knife and pots at his side. 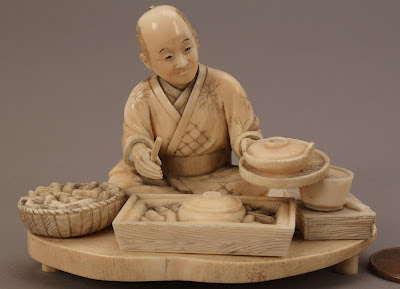 2-1/4"H. Chinese or Japanese mark on base--now owned by the Estate of George Mitchell, co-owner of Mitchell's Candy Store, Nashville, USA who during the course of several trips to China and Japan in the late 19th-early 20th century.purchased the series of ivory sculptures of a man engaged in the act of cooking with two of the sculptures showing him toppling down perhaps under the weight of the cooking. This art form flourished during the Meiji period in Japan from the 18th century onwards. Today, 21.07.2012, I accidentally stumbled upon these sculptures on the Net and thought it to be too apt an illustration for the poem above. "LIked the piece, Vikram and thanks for sharing.Liked esp that part about absolution.Satchida"
"it is really great.this is such a sweet gift which 2010 gave while parting. keep it up.2011 should make us read more of your poems in more of the journals, hindi and english. pls email the email id of adhar.2011 should be a substantial gift to our family with 1985- born project pari vari ki. God bless you all.God bless dearest Akshita for her sweet favour of typing this for us all."